Appearance: Pours a beautifully gold amber that is superbly clear and bright. Nice thick, rocky, two-finger head that recedes slowly leaving near perfect lacing. Smell: Very clean aroma smelling of caramel, mild yeasts and fruits with a hint of hops. A very nice smell and distinct from other beers. Initial Taste: The initial flavor are those bitter hops followed up with sweet caramel and a bread yeast flavor. The hops carry a very mild citrus flavor that balances the sweetness of the caramel, malts and other fruit perfectly. The combination of flavors create a nice smooth mouthfeel. You are left with a clean, dry hoppy after taste that begs you to drink more. Thoughts: Anchor Steam Beer is a very unique beer. 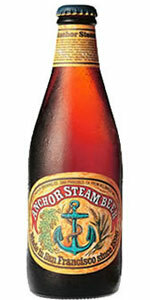 Anchor Brewing Company created their own style of beer called California common beer based on the old Steam Beer style that was popular during the mid 1800’s to the mid 1900’s. This style of beer mixes the best of both worlds, lagers and ales. This style of beer uses lager yeasts but is fermented at ale fermentation temperatures. This beer also uses special Northern Brewing Hops that give this beer that unique earthy aroma and flavor. So why go through all these lengths to make a beer? Simple…to make a beer that is on the most unique beer available. Not only is this Frankenstein of beers unique…its downright delicious. From the thick mountainous head to the smooth bitter yet sweet taste this beer doesn’t disspoint at any level. If you have not had the opportunity to try this classic American Micro I highly reccomend doing so. Happy drinking! I’m drinking one right now and the bitterness is overwhelming. I’m wondering if if this means that it’s gone bad?